Originally this small six person firm was part of a larger firm. They broke away three years ago and ventured out on their own. These career attorneys spent a large portion of their careers in big law. They endured many of the operational headaches and slow processes partners and associates experience in a larger firm. As a small firm, they needed the tools and resources to outperform bigger firms. Did that solution even exist? …they used to [at the bigger firm] use another tool and it was not user-friendly at all. It seemed as though whenever you entered your time it was etched in stone. It was difficult to work with. Attorneys are drowning in non-billable work. Recent reports mention that attorneys lose as much as 6 hours per day to non-billable work. At their old firm, the attorneys were required to go through a convoluted process to get a simple report. We would have to request the reports from accounting and you would have to wait for someone from accounting to run the report, proof it, and get it [back] to you. What if the report was wrong? Or you needed a different report? Or deeper insights on the report you had? You had to go through the same elaborate process each time. There was an elaborate bureaucracy to follow, which is typical for larger firms. Shepherd Prewett needed something different. They needed a practice management solution to solve their firm’s other problems. They needed to be responsive, nimble and efficient. In the past, administrative and support teams were mired in non-billable work. Attorneys were buried with non-billable busy work. If they wanted their firm to perform well, things needed to be different this time. Attorneys at Shepherd Prewett stumbled onto Bill4Time and decided to check it out. The change to Shepherd Prewett’s business was immediately apparent. When we got over here, one of the attorneys, checked into Bill4Time. I don’t know how she found out about it, but it was a blessing. We are to the point where some of the attorneys even enter their own time. One of the partners even generates his own pre-bills and invoices. It’s just that easy for us. The thing about Bill4Time is that it has made the attorneys self-sufficient, for the most part. My boss, Billy Shepherd, runs his own reports. This is something he never could do before. Prior to Bill4Time all reports had to be run by the accounting team. Once I showed him how to generate a report, that was all it took. Attorneys at Shepherd Prewett use the features in Bill4Time to manage the important components of practice management. They are able to focus their time and attention on important yet very specific tasks. At the previous firm, I knew nothing about the pre-bills and invoicing. When we formed the new practice, this became one of my responsibilities. Now pre-bills and invoices are generated in a snap. Each improvement or update made to Bill4Time has proven to be a timesaver. These changes produced a time savings of 50 percent or more. When attorneys need to analyze their client performance data they can do it in seconds. The Shepherd Prewett team can spend their time focused on the to-dos that matter most. Serving their clients and getting paid for their time. The one feature that I’m really in love with now, is the ability to check one box to apply payments to all matters invoiced for a specific client. If you have a client that has multiple matters, and they have been invoiced for a specific period of time that client will usually submit one check to pay for all of their invoices. This new feature allows you to check one box and it automatically selects all the matters recently invoiced. You no longer have to apply payments to each matter individually. The total amount invoiced appears in the accounting section of Bill4Time, once your check and the total invoiced match, you simply fill in a few fields check one box and boom! You’re done applying payments received. The organization-wide results moved from the bottom up. Support teams received immediate value from Bill4Time, which made things easier for associates and partners. Associates and partners quickly jumped on board once they saw the results they were able to achieve with Bill4Time. Using Bill4Time the Shepherd Prewett team has a handle on practice management. They’re easily able to do the heavy lifting at their firm. A simple and straightforward tool means attorneys are free to focus on doing their best work. What happens if they run into problems? The fact of the matter is, that I’m not an accounting person, but this program has just been so easy to use. The articles and online videos are extremely beneficial, but more importantly to me is the technical support staff. Whenever I call everybody’s just so knowledgeable, pleasant and patient. They explain the process and will even walk me through any issue I may be encountering. Bill4Time is just wonderful. I brag about it all the time. Every time I complete my surveys, I’m always very complimentary. Some folks are always so quick to complain when things don’t go right, and we don’t take the time to say when things are good. Bill4Time has been absolutely perfect for our firm. Shepherd Prewett recovered 50 percent of their time. They rely on Bill4Time to manage their legal practice and all that this entails. An easy way to manage their day-to-day operations. It’s given them more free time. It’s drastically reduced their non-billable workload and it’s given attorneys an incredible amount of control over the reports they receive. It enables the Shepherd Prewett team to their best work. Preparation of invoices has gotten so much better and faster. Each time I use it, I’m faster at it. The firm that we broke away from, is now using Bill4Time, and they love it. The service is impeccable and everyone is just so nice. Growing a law firm is challenging. The operational headaches and slow processes most firms struggle with? Those are optional. 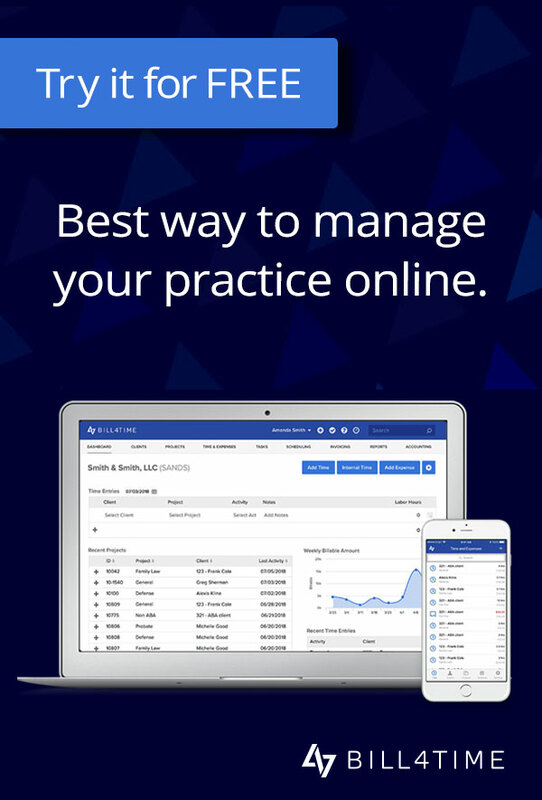 With the right tools and a flexible team, Shepherd Prewett has the practice management support they need to maintain a successful firm.